You may have heard that the Eat Local Challenge is going on this month (which, I realize, is almost over). But you can participate in your own Eat Local Challenge any time of the year. Why bother? Click here for 10 good reasons. You could start today--even if you live in a place where it's still too early for farmers' markets. Try seeking out and eating just one locally produced thing a day. Ask around. You might be surprised to find that there is an amazing cheesemaker located just a few miles away. Or that your favorite supermarket buys some of its produce from nearby growers. Or that your neighbor down the street is an avid edible gardener willing to share. Even locally brewed beer counts! Note: The Locavores use a 100-mile radius around their home to define local foods, which gives you a fairly large hunting ground. For more help finding food nearby, check out LocalHarvest.org. To learn how others are living up to their challenge, visit the new group blog EatLocalChallenge.com. And for some inspiration to support small farmers (along with a healthy serving of gorgeous photos), head over to Small Farms: A Blog From The Heart, where the incredible Tana will have you laughing, crying, and wanting to make tonight's dinner from food that still has dirt clinging to it. Of course you can't get any more local than your own backyard (or windowsill or front porch steps or fire escape). 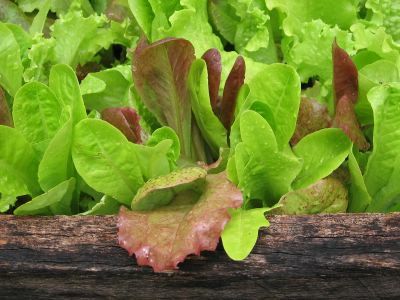 I've been harvesting several varieties of lettuce (including the Rocky Top Mix pictured above from Baker Creek Heirloom Seeds), along with all kinds of other tasty salad greens, for several weeks now. Click here, and I'll have you going from seed packet to salad bowl in under a month—even if your 'garden' consists of a couple of plastic buckets or tubs. I've also been enjoying asparagus from the garden for the past month, though my little bed has only been offering up four or five spears at a time. Tender, locally grown asparagus is still available in many places right now, and I urge you to try to get your hands on some. For interesting ways to prepare it, check out Asparagus Aspirations at Seriously Good, where Kevin has been compiling asparagus recipes from food bloggers around the world all month long. Wondering where Cary is? She's been up to no good in the garden (again), and I have the pictures to prove it. Click here to see for yourself. So what tasty local things have you been eating? eating local... thats hard for me in NYC. nothing is actualy grown or raised here. That Cary is such a character, but so undiciplined! Are you going to take here to lamb obedience school before she starts stealing the tractor? I can't wait to have a garden plot so I can put all your great garden info to use. Does baking your own bread count as eating local even if all the ingredients aren't? Your little darling is a poster child for the Eat Local Challenge and she certainly knows which foods to eat. I've been munching on fresh rhubarb from our Farmers Market all morning and now it feels like I have little sweaters on my teeth. My problem is after such a long winter when the Farmers Market does open I can't get enough. Last week I was into fiddleheads - lots and lots. LOVE THOSE FARMERS! This year we joined a CSA and our first produce pick up is tomorrow. I don't know what else we'll get but I do know that the strawberries are in because they sent out an appeal for strawberry pickers. I look forward to reading more when you have time to post to each -- such a commitment of time you have made for all your fans. We all thank you too! I'm going to hijack your comments! Farmgirl. This is for gustad: in NYC you have one of the best greenmarkets in the United States in Union Square on Mondays, Wednesdays, Fridays and Saturdays. The greenmarket attracts local farmers and is heavily shopped by the City's best chefs. Also you can't forget that Eli Zabar has a 10,000 square foot greenhouse on top of The Vinegar Factory where he grows tomatoes in the winter using recycled heat from the ovens. But of course you know all this, you're pulling our legs. The farms around Durham and Chapel Hill are brimming with delicious late spring fare. Gorgeous lettuces, young kale, arugula, baby yellow squash, strawberries, fava beans, broccoli, purple cauliflower, green garlic, and of course, fresh Cane Creek Farm eggs, chicken, and sausage. All wonderful, all local. Take care! What a nice thing to see in my web stats: all the traffic from your sweet blog. XOX a hundred times, dawl. Thank you so much for the sweet words. I just got back from the farmers market: blood oranges, apricot preserves and a pork carnitas empanada from Frog Hollow Farm, some chipotle-chocolate Donnolly truffles (swoon), sourdough bread, Humboldt Fog goat cheese, and some pea shoots (my favorite). Yumma! Friends and I started phillyfoodshed.blogspot.com to document our efforts at procuring as much food as possible locally. It's been interesting to see how much is actually available to us once we pooled our knowledge. Turns out we have access to much more than any of us individually had thought. Right now, we've had quite a bit of kale, turnips and beets. Our home garden (two 19X20 beds) is giving us lettuce and radishes. AND I've recently located a local rum that makes a wonderful drink with some Rose's Lime Juice (not local, unfortunately). I enjoy Annie's Jellies the Sand Cherry and the choke cherry jelly, our own beef, frozen sweet corn, and canned green beans. It's still a little early in the early to be eating fresh produce from our area, can't wait for the strawberries to bloom. The fields of corn and potatoes are in the ground. Enjoyed your informative blog. It reminded me of all the local farm goods I should be eating and to think about where the food is actuallly coming from.